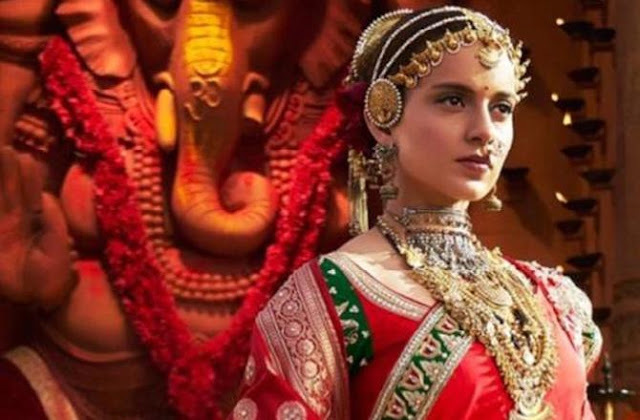 Manikarnika is a big-budget, wholly star-driven, action-packed, period picture. Except the star is female, which is rare enough. As a film, this might seem a bit too ultra-patriotic/nationalistic for the fact that it's set in the mid 1800s, when the idea of India itself wasn't as concrete, let alone the concept of "Swarajya which was first popularly coined by Lokmanya Tilak, only born in 1856. The film itself though, right in its opening disclaimer, washes its hands of any pretense towards complete, uncontestable historical accuracy, which is only for the better. Helps you view it as a fabulous legend/fable first. Be that as it may, the fact that the Indian Revolt/Rebellion of 1857, that began with the Sepoy mutiny, with Mangal Pandey firing the first shot, is widely considered the First War of Indian Independence, among Indians, can't be denied either. At the centre of this piece though, with absolutely no other players even in the periphery, understandably, is Rani Lakshmibai, born Manikarnika, a bibliophile 'brahmin' girl, raised by the Peshwa as a warrior, who eventually takes over as the Queen of Jhansi Yes, this is a big-budget, wholly star-driven, action-packed, period picture. Except the star is female, which is rare enough. Even if you consider Sanjay Leela Bhansali's Padmaavat (or Padmavati), where Deepika Padukone played the eponymous character all right, but the film focused on Ranveer Singh as the antagonist Alauddin Khilji far more. Speaking of which, this is the sort of passion project that Bhansali, as master of magnificence (Padmaavat, Bajirao Mastani, Ram-Leela), has excelled in to a point that subsequently similar works, by most other craftsmen, are likely to somewhat pale in contrast. And so while the inspirations here are obvious, it might be unfair to compare still. This holds just as true for any allusion to SS Rajamouli's astoundingly massive Baahubali, given that the screenwriter (Vijayendra Prasad) is the same. For, the story here has to be enjoyed for its own worth. It relates to a legend that pretty much remains unsurpassed in Indian history—of a woman, who lost her husband, the king, and her little son, the heir, giving way to the British to take over her kingdom, with help of locals and a 'doctrine of lapse', which applied to heirless princely states.